on the recommendation of the Minister of Consumer Affairs made in accordance with section 27(3) of that Act. These regulations are the Consumer Information Standards (Water Efficiency) Regulations 2017. These regulations come into force on 1 October 2017. These regulations apply to water-using equipment, except where that equipment has been used by a person in New Zealand. Equipment is not used by a person by reason only that the person acquired the equipment for the purpose of resupplying it in trade. Regulations 7 to 13 and Schedules 2 to 4 are consumer information standards for the water-using equipment to which these regulations apply for the purposes of section 27 of the Fair Trading Act 1986.
for showers and tap equipment, the intended water supply pressure (that is, mains pressure or low pressure). the words “In accordance with AS/NZS 6400:2016” . A label that is required to be displayed on water-using equipment by regulation 7, 8, or 9 must comply with the information labelling requirements in Schedule 2.
the advice that those components are required for the showers, tap equipment, lavatory equipment, or urinal equipment to achieve the equipment’s stated star rating or water consumption. Water-using equipment that is labelled in compliance with AS/NZS 6400:2016 is to be treated as complying with regulations 7 to 11. An offer, on an Internet site, to supply dishwashers or clothes washing machines must also have the stated wash programme clearly displayed. A label referred to in subclause (1)﻿(a) may be scaled up or down on the Internet site, provided it is still easy to read and clearly visible. The Consumer Information Standards (Water Efficiency) Regulations 2010 (SR 2010/81) are revoked on the close of 30 September 2019.
compliance with either set of regulations is compliance with the other set of regulations. Identify the model’s brand name, for example, the trading name of the model’s manufacturer or other identifier. Identify the model, for example, by a model number or another identifier. State the model’s water consumption, calculated in accordance with clause 3.4.2 of AS/NZS 6400:2016.
for low pressure showers, clause 3.4.4 of AS/NZS 6400:2016. 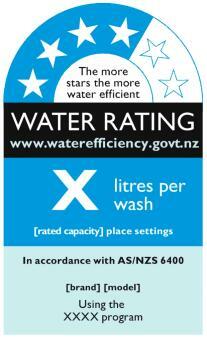 State the model’s water consumption, calculated in accordance with clause 4.4.2 of AS/NZS 6400:2016. State the model’s star rating, calculated in accordance with clause 4.4.3 of AS/NZS 6400:2016. State the model’s water consumption, calculated in accordance with clause 6.4.2 of AS/NZS 6400:2016. 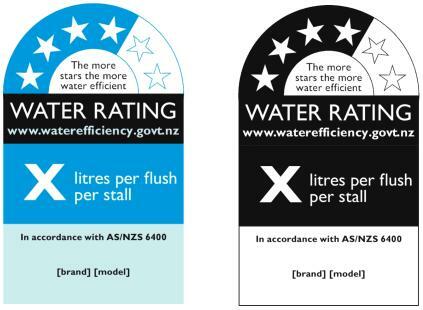 State the model’s star rating, calculated in accordance with clause 6.4.3 of AS/NZS 6400:2016, except that lavatory equipment with a flush figure that is higher than is required to have a 1 star rating must be given a rating of zero stars. 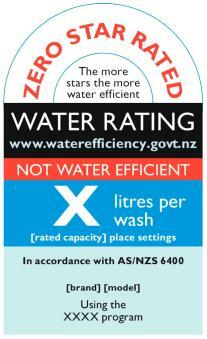 State the model’s water consumption, calculated in accordance with clause 7.4.3 of AS/NZS 6400:2016. State the model’s star rating, calculated in accordance with clause 7.4.4 of AS/NZS 6400:2016. 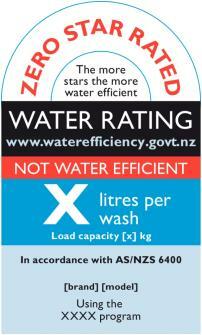 State the model’s water consumption, calculated in accordance with clause 8.2.2 of AS/NZS 6400:2016. State the model’s star rating, calculated in accordance with clause 8.2.3 of AS/NZS 6400:2016. State the model’s rated capacity before the words “place settings” (unless a combined label is used in accordance with clause 8.3.2.2 of AS/NZS 6400:2016). Identify the wash programme used to determine the water efficiency of the dishwasher at its rated capacity (unless a combined label is used in accordance with clause 8.3.2.2 of AS/NZS 6400:2016). State the model’s water consumption, calculated in accordance with clause 9.2.2 of AS/NZS 6400:2016.
a clothes washing machine with a water consumption figure that is higher than is required to have a 1 star rating must be given a rating of zero stars. State the model’s rated load capacity before the letters “kg” (unless a combined label is used in accordance with clause 9.4.2.2 of AS/NZS 6400:2016). Identify the wash programme used to determine the water efficiency of the clothes washing machine at its rated load capacity (unless a combined label is used in accordance with clause 9.4.2.2 of AS/NZS 6400:2016). 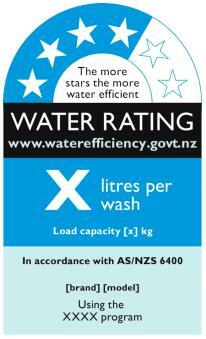 Labels for showers with a star rating of 1 or more stars must comply with clause 3.5.4.1 or 3.5.4.2 of AS/NZS 6400:2016 (including being in the format and dimensions indicated in figure 3.5 or 3.6 of AS/NZS 6400:2016). 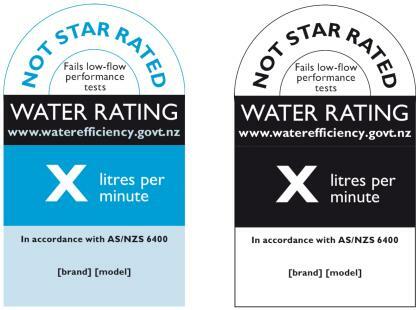 Labels for tap equipment with a star rating of 1 or more stars must comply with clause 4.5.4.1 or 4.5.4.2 of AS/NZS 6400:2016 (including being in the format and dimensions indicated in figure 4.3 or 4.4 of AS/NZS 6400:2016). Labels for lavatory equipment with a star rating of 1 or more stars must comply with clause 6.5.2 of AS/NZS 6400:2016 (including being in the format and dimensions indicated in figure 6.4 of AS/NZS 6400:2016). 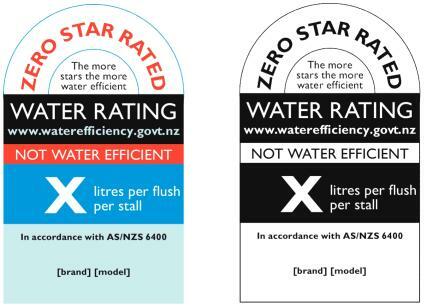 Labels for urinal equipment with a star rating of 1 or more stars must comply with clause 7.5.2.1 of AS/NZS 6400:2016 (including being in the format and dimensions indicated in figure 7.3 of AS/NZS 6400:2016). Labels for dishwashers with a star rating of 1 or more stars must comply with clause 8.3.2.1 or 8.3.2.2 of AS/NZS 6400:2016 (including being in the format and dimensions indicated in figure 8.2 or 8.3 of AS/NZS 6400:2016). Labels for clothes washing machines with a star rating of 1 or more stars must comply with clause 9.4.2.1 or 9.4.2.2 of AS/NZS 6400:2016 (including being in the format and dimensions indicated in figure 9.2 or 9.3 of AS/NZS 6400:2016). 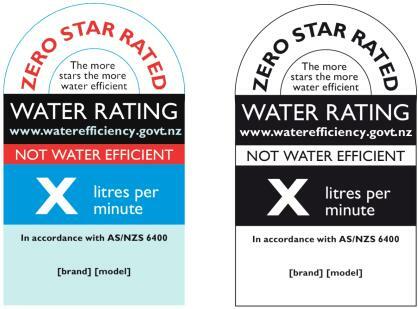 Labels for showers with a star rating of zero stars must comply with clause 3.5.4.5 of AS/NZS 6400:2016 (including being in the format and dimensions indicated in figure 3.9 of AS/NZS 6400:2016). Labels for tap equipment with a star rating of zero stars must comply with clause 4.5.4.3 of AS/NZS 6400:2016 (including being in the format and dimensions indicated in figure 4.5 of AS/NZS 6400:2016). Labels for lavatory equipment with a star rating of zero stars must be in the format and dimensions indicated in figure 6.4 of AS/NZS 6400:2016. 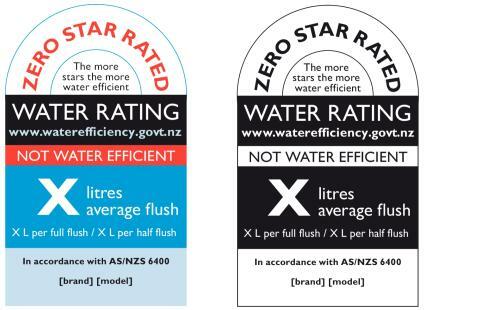 Labels for urinal equipment with a star rating of zero stars must comply with clause 7.5.2.2 of AS/NZS 6400:2016 (including being in the format and dimensions indicated in figure 7.4 of AS/NZS 6400:2016). Labels for dishwashers with a star rating of zero stars must comply with clause 8.3.2.3 of AS/NZS 6400:2016 (including being in the format and dimensions indicated in figure 8.4 of AS/NZS 6400:2016). Labels for clothes washing machines with a star rating of zero stars must be in the format and dimensions indicated in figure 9.2 of AS/NZS 6400:2016. 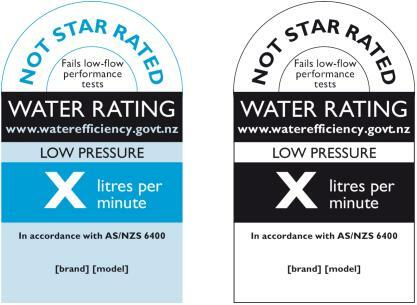 Labels for showers that are not star rated must comply with clause 3.5.4.3 or 3.5.4.4 of AS/NZS 6400:2016 (including being in the format and dimensions indicated in figure 3.7 or 3.8 of AS/NZS 6400:2016). placed adjacent to the shower on any display for the shower. placed adjacent to the tap equipment on any display for the tap equipment. placed adjacent to the lavatory equipment on any display for the equipment. placed adjacent to the urinal equipment on any display for the equipment. on both sides of a swing tag that is affixed to the dishwasher. on both sides of a swing tag that is affixed to the clothes washing machine. These regulations, which come into force on 1 October 2017, prescribe consumer information standards for showers, tap equipment, lavatory equipment, urinal equipment, dishwashers, and clothes washing machines (the equipment) for the purposes of the Fair Trading Act 1986 (the Act). These regulations replace the Consumer Information Standards (Water Efficiency) Regulations 2010 (the 2010 regulations). The 2010 regulations prescribed consumer information standards for the equipment by reference to Australia/New Zealand Standard AS/NZS 6400:2005 (with some variations). That standard has now been updated and replaced with Australia/New Zealand Standard AS/NZS 6400:2016, and these regulations prescribe consumer information standards for the equipment by reference to that new standard (with some variations). These regulations apply to equipment that has not been used by a person in New Zealand. These regulations require the labelling of equipment when it is supplied or physically displayed for supply. The labelling requirements depend on whether the equipment is packaged or unpackaged. Any ancillary component necessary to achieve the water efficiency of the equipment must be identified, along with assembly or installation instructions, when the equipment is supplied. These regulations also require that offers to supply equipment on an Internet site must contain similar information about water efficiency. A person commits an offence under the Act if he or she supplies, offers to supply, or advertises to supply the equipment to which these regulations apply, unless that person complies with the consumer information standards set out in these regulations. As a transitional measure, during the period beginning on 1 October 2017 (when these regulations come into force) and ending on the close of 30 September 2019 (when the 2010 regulations are revoked), a person may comply with either set of regulations.